The financial and banking sectors have been going through a massive transformation over the past few years, and a substantial part of it has happened in London. The city is not only the world’s financial capital now, but also Europe’s FinTech capital, with the highest number of FinTech startups in EU. This sector is becoming increasingly crowded. It has been given so much attention recently, that it is difficult for any new entrance to be noticed, and big institutions cannot really compete with more flexible startups. What do users type into Google? They want to know which FinTech companies are based in London, what jobs are available in the industry, and who is investing in FinTech startups. Innovators, founders and investors need space to share ideas, find inspiration, stay on top of things, and, most importantly, find new business. That’s what industry events are for, and London has a lot to offer in this area. There are hundreds of conferences, meetups and other events every year. TechCrunch Disrupt London, ad:tech London, Lean Startup Summit, London Tech Week or Wired are among the most popular searches. It’s not easy to satisfy the appetites of nearly 10 million people everyday. Maybe that’s why so many food and drink startups pop out each year. Actually, around 15,000 food startups emerge into the market every year. We can name a few very successful ones, like Deliveroo, which is the biggest UberEats competitor, FeedUp, that enables people to come together and share unique pop-up dining experiences, or Gousto, an app that lets users to order all the necessary ingredients for carefully selected recipes. The list is long, but unfortunately 90 percent of food startups don’t make it past their first birthday. The highly competitive market is supported by an active community. If you operate in the food industry, or want to step onto the market, join one of the meetups for food startups or try the exclusive food industry crowdfunding website. The unexpected news that the UK will leave the EU has raised widespread concerns about the future of the technology sector. A potential wave of start-ups opting to relocate their headquarters to other European hubs, such as Berlin or Amsterdam, can slow down the thriving tech industry in London. Business founders,on the other hand, are worried that investors would shift their attention out of the UK, leaving the established as well as emerging companies with no further funding. The repercussions of Brexit might also cause a shortage of talent. London relies on foreign experts and any limits on the freedom of movement might discourage qualified and skilled workers from coming to the city. The Government has already taken steps to secure the access to foreign talent after the Brexit vote. The future is still unknown as the negotiations are underway. East London Tech City, known as Silicon Roundabout is the name used to describe the startup cluster in London's EC1V postcode. As the area around Old Street started to become fashionable a few years back due to good location and favourable rent prices, many start-ups decided to locate their headquarters there. In 2014, more than 15 thousand companies set up their businesses in EC1V. The initial advantage and the main reason why so many startups opened offices in the area eventually became thereason why so many have left. Silicon Roundabout has seen a 70-percent fall in the number of new start-ups as the surging rents in the increasingly gentrified area forced the companies to try their luck elsewhere. Despite a noticeable drop in the number of companies interested in the hub, Silicon Roundabout has a high position in Google Search. Users want to know what jobs can still be found in the area, what events to join and what companies have stayed there despite rising prices. Incubators provide startups with support and services such as training for entrepreneurs, and access to networks and specialist equipment. They also have a significant impact on startup success. According to the report, The Rise of the UK Accelerator and Incubator Ecosystem, entrepreneurs and startups that join incubator programmes are likely to secure significant financial investment – around £68,000 on average. The survival rate for them reached almost 92 percent, compared to a two-year survival rate of 75.6 percent for all small businesses. London is home for 29 incubators which makes the city the UK’s leader in the area. However, despite the highest absolute number of such institutions in the country, London has one of the lowest concentrations of incubators per 1000 businesses, making it a highly competitive arena. Incubators and accelerators are mistakenly considered to represent the same concept. Despite many similarities, they are two different things. The latter is focused on growth and aims at scaling businesses, whereas an incubator's main goal is to launch companies through the initial stages and the goal-setting period. Nesta Innovation Foundation identified 163 accelerators in the UK, and more than half of them are currently based in London. 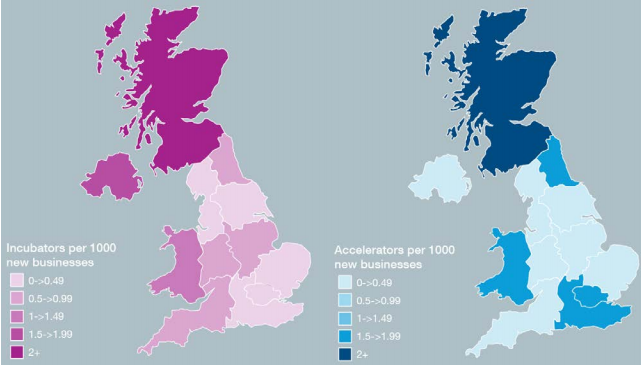 However, this ratio is slowly changing, and many more new accelerators are being set up outside the capital. 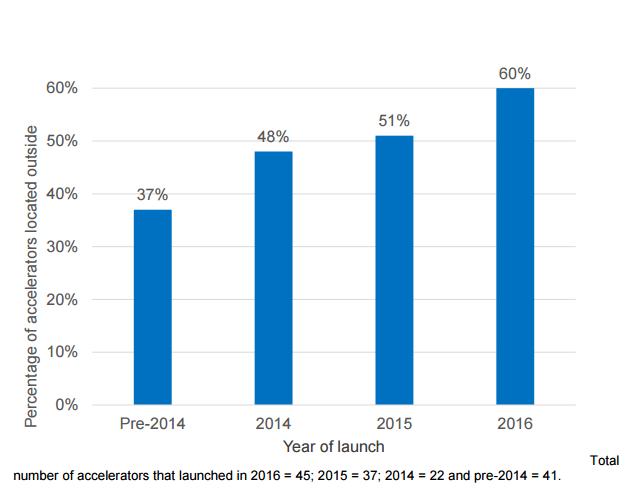 In 2014, fewer than half of the accelerators in our database were based outside London, but in 2016, the figure has gone up to 60 percent. Coworking spaces changed the way we do business. Whether you’re a freelancer, a startup owner, or a small team, coworking can bring many benefits to your work. It boosts creativity, enables you to build up your network, find potential partners and is definitely a more appropriate environment for getting things done than a nearby Starbucks. There’s an abundance of coworking spaces in London – Tech.London has listed over 1,000 venues where you can find a desk for yourself or a room for a team. The demand is very high as well. There are over 5,000 monthly Google searches regarding coworking spaces in London. Those were the popular keywords regarding the London tech scene buzzing in Google in early 2017. Check out the most promising startups in the British capital this year!